GlutenCHECK is a rapid test for use at home to detect the presence of IgA tissue transglutaminase antibodies (tTG) in whole blood. 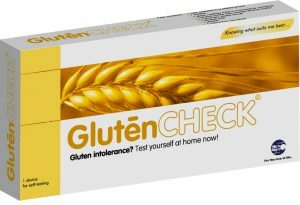 GlutenCHECK is suitable for both, an initial diagnosis of gluten intolerance as well as a therapy follow-up. a-tTG-IgA antibody level should fall when gluten is removed from the diet. After 6 months on gluten-free diet the antibodies will often become undetectable. The diagnosis must be confirmed by the physician with further recommendation to maintain a gluten-free diet. Each kit contains everything necessary for the test performance: a test cassette, an instruction leaflet, a solution bottle with sample dilution buffer, 1 automatic sterile lancet for comfortable blood sampling, a glass capillary tube, a pipette, an alcohol pad and a plaster. The results can be read within 10 minutes. The gluten intolerance (celiac disease), known as a sprue in adults, is an autoimmune disorder of the small intestine, when the immune system attacks the body‘s own tissues. The common symptoms of gluten intolerance include bloating and diarrhea, caused by a reaction to a gluten protein found in many foods. The following symptoms could be also a sign of gluten intolerance, such as weight loss, malnutrition and skin disorders. Here you can download our easy to understand instructions for use which contains additional information about our products.